My Lowe’s Life is Lowe’s employee website, created to help make life easier, and simpler, for Lowe’s Home Improvement Warehouse’ more than 185.000 associates. Use the MyLowesLife.com portal to check your work schedule, company emails, view payslips, manage your benefits at Lowe’s, and much more. How do I log in to MyLoweslife? The official login page for My Lowe’s Life can be found here. Find the login area in the top left hand side of the page. Enter your Sales Number and Password to enter the portal. Your Lowe’s Sales Number, or ID number, will have been given to you my yout Human Resources representative. Always check that you are on the official URL address before you sign in, to avoid ‘phishing’ scams. For the desktop and laptop version of MyLowesLife, the correct url is: https://www.myloweslife.com/ which redirects to: https://lius.myloweslife.com/…. The Mylowes Mobile-Ready login page is located here. The login page will look like the desktop sign in page. If you are a former Lowe’s employee, then you must log in from a seperate page. Find the ‘Click Here’ link at the middle of the Myloweslife.com page and click on it. You will be redirected here. Enter your User ID and Password to enter. Former Lowe’s associate must use another login page to enter the system. The MyLowesLife SSO login page will look like the image above. To access, enter your user ID and password. I have forgotten my MyLowesLife.com Password. How can I reset my password? Go to the official My Lowe’s Life associate login portal. Find the ‘Forgot Password?’ option below the Password Field at the left side of the screen. Answer the security question that you chose when you registered. Enter your email address, and an email will be sent to you with further instructions. PS: Occassionally, with server overload, I have noticed that the Rest Password page will retun an “Internal Server Error”, and cannot therefore ne accessed. 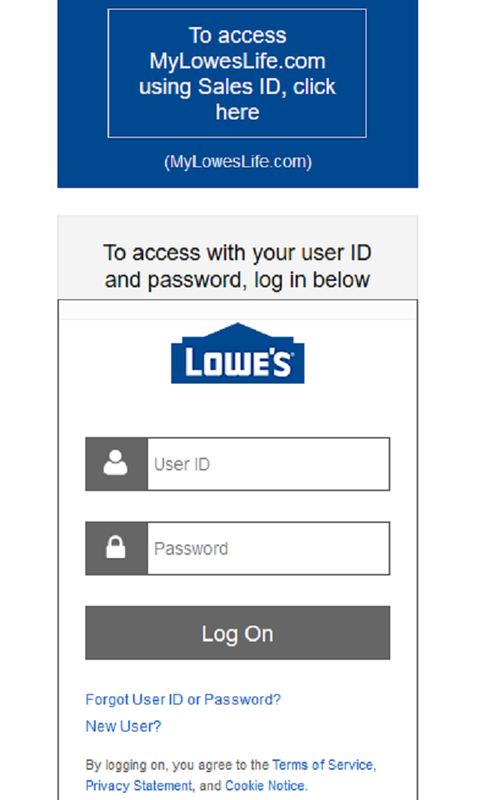 In this cas visit the MObile login page instead at https://www.lowes.com/mylowes/login, and click on ‘Forgot Password’. Then, enter your email address for further instructions on how to reset your MyLowesLife password. How to I contact the MyLowesLife Human Ressources apartment? What I use the MyLowesLife employee website for? Follow company announcements and news. Health Insurance management, including prescription drugs. Life and disability insurance management. Other MyLoweslife Websites and Ressources. I am trying to apply for a full time job at Lowes in Griffin, Ga. I work there part time now. How do I do this?